Hello friends, hope you all are fine and having fun with your lives. Today’s post is about interfacing of RFID module RC522 with Arduino. RC522 is very simple yet effective module. It is an RFID module and is used for scanning RFID cards. Its a new technology and is expanding day by day. Now-a-days it is extensively used in offices where employees are issued an RFID card and their attendance is marked when they touch their card to rfid reader. We have seen it in many movies that when someone places ones card over some machine then door opens or closes. In short, its a new emerging technology which is quite useful. I recently get a chance to work on a project in which I have to use RFID reader to scan cards. In this project I have used it for for student attendance so I thought to share it on our blog so that other engineers could get benefit out it. Let’s first have a little introduction of RFID and then we will look into how to interface RC522 with Arduino. RFID is the abbreviation of Radio frequency identification. RFID modules use electromagnetic fields to transfer data between card and the reader. Different tags are attached to objects and when we place that object in front of the reader, the reader reads that tags.Another benefit of RFID is that it doesn’t require to be in a line of sight to get detected. As in barcode, the reader has to be in the line of sight to the tag and then it can scan but in RFID there’s no such restriction. 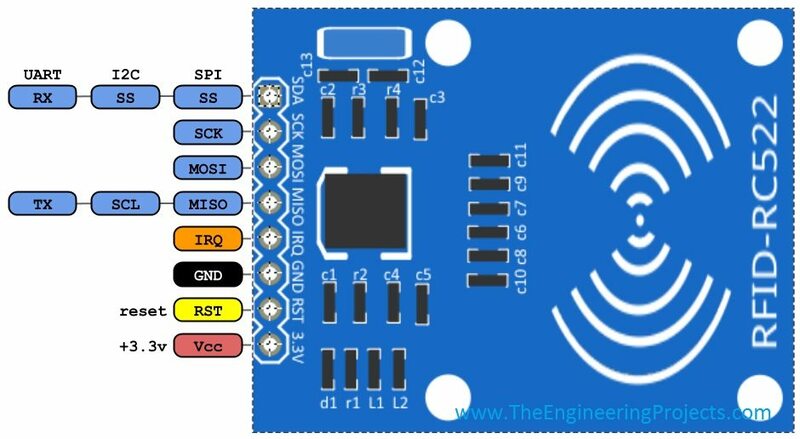 So, let’s get started with Interfacing of RFID RC522 with Arduino. Interfacing of EasyVR with Arduino. Interfacing of GPS Module with Arduino. 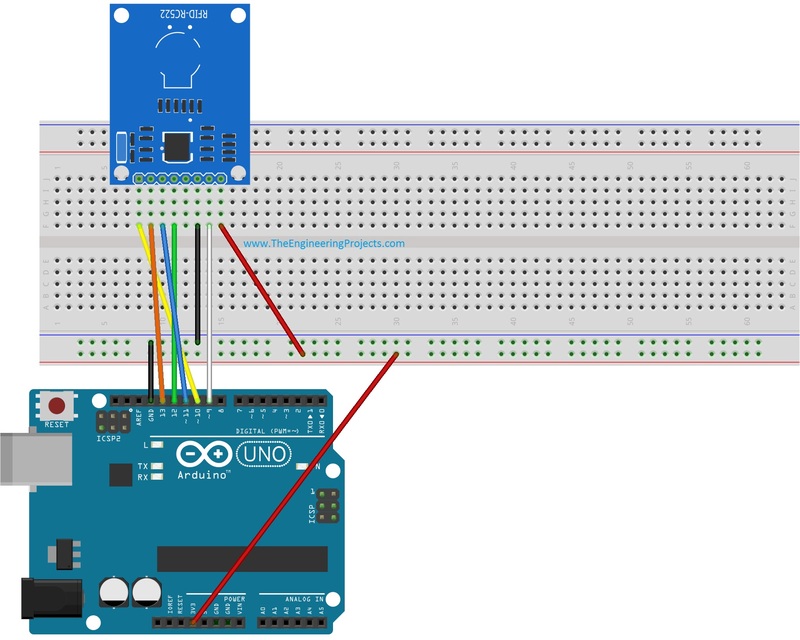 Now, I suppose that you have connected your RFID module with Arduino as shown in above figure and table, which is quite simple. You just need to connect total 7 pins, IRQ is not connected in our case. Now next step is the coding, so first of all, download this Arduino library for RFID RC522 module. Its a third party library, we haven’t designed it, we are just sharing it for the engineers. Now coming to the final step. Upload the below code into your Arduino UNO. Now using the first code I get the card number for all RFID cards and then in second code I used these numbers and place the check now when first card will be placed it will show 1 on the serial port and so on for other cards. So, what you need to do is to use the first code and get your card number and then place them in second code and finally distinguish your cards. Quite simple and easy to work. Hope I have explained it properly but still if you get any problem ask me in comments. i have the same problem. it is showing error “stray ‘342’ in program”. I had the same problem and found that there is an issue with the font or something during the copy/paste process in regards to the double quotes. So, just remove the 4 double quotes and type them again in your code which should resolve that problem! Is it possible to connect multiple readers to a single arduino? If so how can that be done. I can get one to work just find, once I introduce another I get no response. Yes you canconnect multiple RFID with Arduino. In this case you need to add a virtual SPI port. Add me on Skype and we will discuss it in detail. My skype id is theeenggprojects. I have the same problem. It just takes you to the same website. Hi! First of all, thanks for the project! I’m trying to start ‘playing’ with Arduino and this RFID module was the chosen one to be the first. I’ve uploaded the code to my UNO but I’m not able to see the card numbers anywhere. Tried to use the Serial Monitor, but nothing happens. How/Where can I see this? Thanks in advance! You should use the first code given in the article. This code will give you the RFID value of card in your Serial Monitor. In the second code, place that card value in the code and it will place the check. where exactly in the 2nd code do i put the card no received from the first code? can anyone suggest pin configuration for arduino nano for rfid 522? Otherwise I got nothing out. 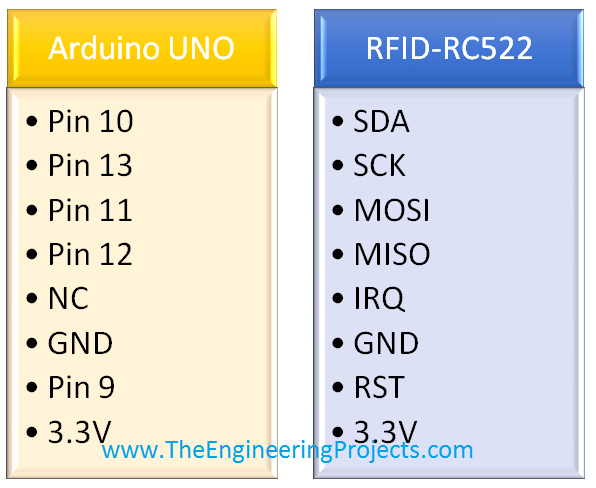 sir is there any way of scanning of multiple rfid tags with rc522 and arduino uno? hello mister, my name is Sony, i cant download header for this program, can you help me? I never tried but i think yeah you can do it, it takes usec to scan so it will be like one after another but real quick. Why doesn’t the download button work? If somebody gave the link it would be helpful. The download link is down, please link active. Thank’s! can you help me ???????? Yeah add me on Skype and we will discuss it out. In your second code can please tell me that where to place the id of my tag ? Please help me to get the link for downloading RFID reader module library for proteus isis. I’m waiting your response. Thank you. Please help me to get the link for downloading RFID reader module library for proteus isis. I’m waiting your response. how to write a no. on the card? ((If its the second code i am unable to figure out hoe you wrote so on the card)) Please help me out! Hai, i am new to this field. I want to ask how to do this project on proteus because the rc522 component was absent in the proteus lib. Anyone know where to download the rc522 for proteus? We haven’t designed it yet. have used most of the included example sketches successfully. I saw it work and only time. hi! is it possible to use the rfid as an input device then the ouput will be sent through sms by a gsm module?if yes, how will the code be?thanks!